The transient receptor potential ankyrin 1 (TRPA1) channel has been implicated in different pathophysiologies that include asthma, cough, itch, and inflammatory pain. Agonists of TRPA1 such as mustard oil and its key component allyl isothiocyanate (AITC) cause pain and neurogenic inflammation in humans and pain behaviors in rodents. Hence, TRPA1 antagonists are being pursued as potential therapeutics. With the goal of generating monoclonal antibodies (mAbs) to human TRPA1 that could act as selective antagonists, we immunized mice with a variety of antigens expressing TRPA1 channels. After generation of hybridomas, the hybridoma conditioned media were screened to identify the mAbs that bind TRPA1 channels by a flow cytometry assay utilizing U2OS or Chinese hamster ovary (CHO) cells stably expressing TRPA1. The purified IgGs from the hybridomas that showed selective binding to TRPA1 were evaluated for antagonism in agonist-induced 45Ca2+ uptake assays using CHO-TRPA1 cells. Several of the mAbs showed concentration-dependent inhibition of AITC and cold (4°C) activation of TRPA1. The most potent mAb, 2B10, had IC50 values of approximately 260 and 90 nM in the two assays, respectively. These antagonist mAbs also blocked osmotically activated TRPA1 as well as activation by an endogenous agonist (4-oxo-2-nonenal). In summary, we generated mouse mAbs against TRPA1 that act as antagonists of multiple modes of TRPA1 activation. Plant irritant chemicals such as mustard oil (Jancsó et al., 1968; Reeh et al., 1986; Koltzenburg et al., 1993) cause pain in humans and pain behavior in rodents by excitation of sensory nerve fibers (Koltzenburg et al., 1993). The active component in mustard oil, allyl isothiocyanate (AITC), selectively activates transient receptor potential ankyrin 1 (TRPA1), a nonselective cation channel expressed in the nerve terminals that innervate the skin, specifically small diameter neurons of the dorsal root, and trigeminal ganglia (Bandell et al., 2004; Jordt et al., 2004). Other irritant compounds such as allicin and cinnamaldehyde also activate TRPA1 (Bandell et al., 2004; Bautista et al., 2005; Macpherson et al., 2005). Since these compounds form covalent adducts with thiols, other reactive chemicals such as acrolein, iodo-acetamide, N-methylmaleimide, and formalin were evaluated and shown to activate TRPA1 through reversible covalent modification of cysteines in the intracellular loops of TRPA1 (Bautista et al., 2006; Hinman et al., 2006; Macpherson et al., 2007; McNamara et al., 2007). Reactive chemicals such as AITC do not cause pain behavior in TRPA1 knockout mice, confirming that their actions are mediated exclusively by TRPA1 (Bautista et al., 2006; Kwan et al., 2006). These studies resulted in the proposal that TRPA1 acts as a sensor for reactive chemicals in the body (Gerhold and Bautista, 2008). In agreement with this hypothesis, it was reported that the endogenous aldehyde 4-hydroxynonenal (4-HNE) causes pain and neurogenic inflammation through activation of TRPA1 (Trevisani et al., 2007). Furthermore, a number of studies also suggested that TRPA1 plays a role in itch (Wilson et al., 2011, 2013) as well as cough and asthma (Taylor-Clark et al., 2009; Viana and Ferrer-Montiel, 2009; Geppetti et al., 2010). In addition to agonists of TRPA1 causing pain in humans and pain behaviors in rodents, a human genetics study reported that a gain-of-function mutation in TRPA1 causes familial episodic pain syndrome (Kremeyer et al., 2010). Furthermore, inflammation- and nerve injury-induced TRPA1 expression in sensory neurons was reported to contribute to cold hyperalgesia (Obata et al., 2005). Antisense knockdown of TRPA1 was also reported to alleviate cold hyperalgesia after spinal nerve ligation in rats (Katsura et al., 2006). Inhibition of TRPA1 by a potent and selective antagonist [A-967079; (1E,3E)-1-(4-fluorophenyl)-2-methyl-1-pentene-3-one oxime] relieved cold allodynia in a chronic constriction injury model of pain and reversed the grip force deficit in an monoiodoacetate-induced osteoarthritis model (Chen et al., 2011). In all, these studies suggest that TRPA1 is a potential target for novel therapeutics (McMahon and Wood, 2006; Viana and Ferrer-Montiel, 2009; Lapointe and Altier, 2011; Strassmaier and Bakthavatchalam, 2011; Meseguer et al., 2014). Based on the published feasibility (Xu et al., 2005; Klionsky et al., 2006; Gómez-Varela et al., 2007; Naylor and Beech, 2009; Sun and Li, 2013), we attempted to generate monoclonal antagonist antibodies to TRPA1. Here, we report the generation and pharmacological characterization of monoclonal antibodies (mAbs) that antagonize cold, exogenous, and endogenous ligand activation of human TRPA1. Cell Lines Expressing Human TRPA1. Generation of Chinese hamster ovary (CHO) cell lines stably expressing human transient receptor potential ankyrin 1 (hTRPA1), rat transient receptor potential ankyrin 1 (rTRPA1), or human transient receptor potential melastatin 8 (hTRPM8) and their functional characterizations were previously described (Klionsky et al., 2007; Gavva et al., 2012). To construct the hTRPA1-FLAG sequence, a DNA fragment encoding the FLAG tag (DYKDDDDK) was inserted into the predicted extracellular loop 1 of hTRPA1 at amino acid 756. The resulting FLAG-tagged gene, hTRPA1-FLAG, was packaged into a lentiviral vector as previously described (Barry et al., 2001; Lippa et al., 2007). U2OS cells constitutively expressing hTRPA1-FLAG were generated by transduction of a lentiviral vector carrying hTRPA1-FLAG and were sorted for high expressers by fluorescence-activated cell sorter (FACS) flow cytometry using the anti-FLAG M2 mAb (Agilent Technologies, Santa Clara, CA). Generation of Mouse mAbs to hTRPA1. Cells, plasmid, and recombinant adenoviral vector expressing TRPA1 with immune-modulating modifications (for breaking immune tolerance) were immunized in different mouse strains (Fig. 1). Immunization was performed as described in the published international patent application (Arvedson et al., 2009). Conditioned media harvested from hybridoma lines were screened by high-throughput FACS to identify mAbs that selectively bind to U2OS-hTRPA1-FLAG cells. To subclone the hybridoma lines, cells were seeded into 96-cell plates by a FACS sorter and cultured. Conditioned media harvested from the hybridomas were screened for hTRPA1 binding by FACS. Conditioned media from hybridomas as well as monoclonal lines 2B10 and 2D1 were subjected to mAb purification using Protein G column chromatography (GE Healthcare Life Sciences, Piscataway, NJ). Purified antibodies and mAbs 2B10 and 2D1 were used in various assays described below. Flow scheme of anti-hTRPA1 antibody generation and characterization. The process for generation of anti-hTRPA1 antibodies is summarized. The criteria for antibody selection are shown next to arrows. The two antibodies selected through this process are 2B10 and 2D1, which are characterized in various assays. Flow cytometry was performed as previously described (Pontén et al., 2013). In brief, U2OS-hTRPA1-FLAG cells were obtained by collecting the top 5% of sorted cells by staining with anti-FLAG M2 mAb (10 μg/ml) and goat anti-mouse phycoerythrin (2 μg/ml; BD Biosciences, Brea, CA). Sorted cells were cultured, tested in an AITC-induced 45Ca2+Ca uptake assay, and used for binding screening of murine anti-hTRPA1 hybridoma lines. For FACS binding screening, U2OS-hTRPA1-FLAG and U2OS parental cells were stained with conditioned media of hybridoma lines and goat anti-murine IgG-allophycocyanin (2 μg/ml; BD Biosciences). CHO-hTRPA1 cells were induced with tetracycline a day before the FACS assay. Induced and uninduced CHO-hTRPA1 cells were incubated with purified anti-hTRPA1 antibodies (10 μg/ml) and stained with goat anti-murine IgG-allophycocyanin. To distinguish live and dead cells in the FACS assay, 7-amino-actinomycin D (BD Biosciences) was added to the stained induced and uninduced CHO-hTRPA1 cells. Characterization of TRPA1 Binding mAbs as Antagonists. CHO cells expressing human TRPA1 or TRPM8 were used in the agonist-induced 45Ca2+ uptake assay (Klionsky et al., 2007) to identify TRPA1 antagonist mAbs. Twenty-four hours before the assay, cells were seeded in Cytostar 96-well plates (GE Healthcare Life Sciences) at a density of 3.0 × 104 per well and TRPA1 channel expression was then induced with 0.5 µg/ml tetracycline. For the 45Ca2+ uptake assay, the culture media was removed first, and cells were then treated with purified mAbs or control IgG for 30 minutes or with positive control compound(s) for 10 minutes at 37°C. 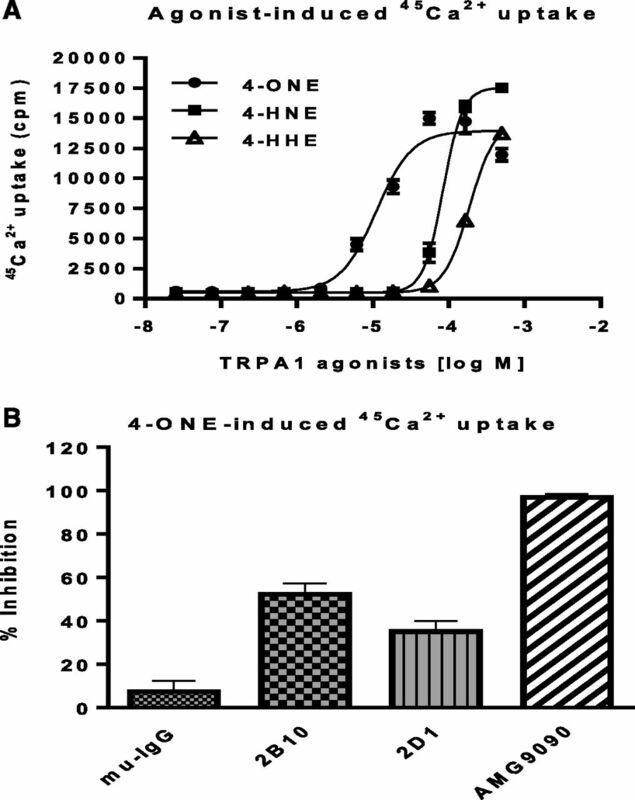 The activation of TRPA1 was measured as the cellular uptake of radioactive calcium (a final 45Ca2+ concentration of 10 µCi/ml; MP Biomedicals, Irvine, CA) with different TRPA1 activators at EC90 [AITC = 80 µM, osmolarity = 50 mOsmol/l, and 4-oxo-2-nonenal (4-ONE) = 37 µM] for 3 minutes at room temperature. Cold activation of TRPA1 was achieved at 4°C for 12 minutes. The plates were washed twice with phosphate-buffered saline containing 0.1 mg/ml bovine serum albumin using an ELX405 plate washer (Bio-Tek Instruments, Winooski, VT) before reading them on a TopCount microplate scintillation and luminescence counter (PerkinElmer Inc., Santa Clara, CA). The data were processed using GraphPad Prism software (GraphPad Software Inc., San Diego, CA) and are expressed as the mean ± S.D. Functional Characterization of the TRPA1-FLAG Expressing Cell Line. To screen the mAbs for TRPA1 binding efficiency in the FACS assay, we first generated a positive control U2OS cell line expressing hTRPA1 with a FLAG tag inserted into the predicted extracellular loop 1. These cells were first screened for AITC-induced 45Ca2+ uptake to confirm that the function of the channel was not altered (Fig. 2A). 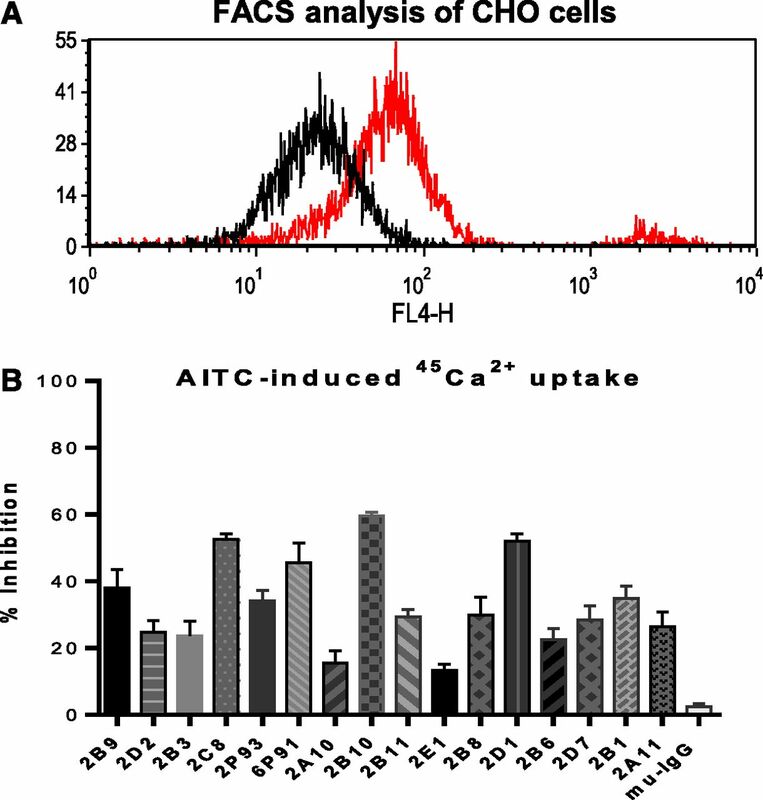 As seen with the positive control CHO-hTRPA1 cells, AITC induced a significant 45Ca2+ uptake into the U2OS-hTRPA1-FLAG cells, demonstrating that the epitope-tagged hTRPA1 protein was functional. We then assayed the cells by FACS with anti-FLAG M2 antibody staining and found that there was a significant level of surface hTRPA1-FLAG expression compared with the control parental cells (Fig. 2B). 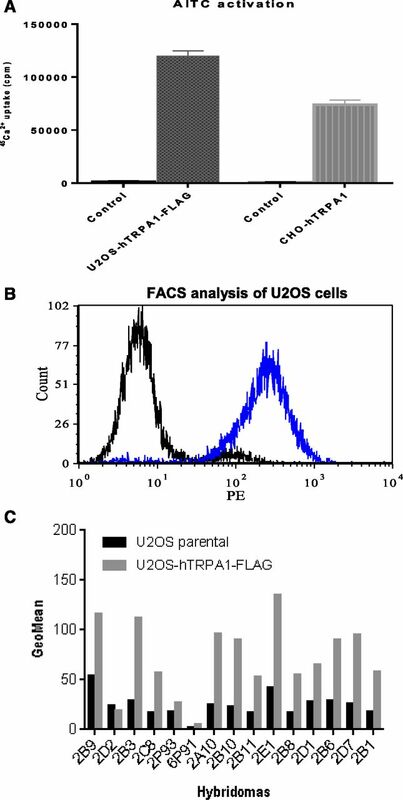 U2OS-hTRPA1-FLAG cells were predominantly used for the FACS binding screening assays and CHO-hTRPA1 cells were used for the agonist-induced 45Ca2+ uptake assays. Characterization of U2OS-hTRPA1-FLAG cells. (A) Both hTRPA1-FLAG and hTRPA1 are activated by AITC in the 45Ca2+ uptake assay. U2OS parental and expressing hTRPA1-FLAG cells (dark gray) were tested in the AITC-induced 45Ca2+ uptake assay. Induced and uninduced CHO-hTRPA1 (light gray) cells were used as positive and negative controls, respectively. (B) Flow cytometry histograms (overlays) showing FLAG tag staining of hTRPA1-FLAG. hTRPA1-FLAG was recognized by anti-FLAG M2 mAb binding to U2OS-hTRPA1-FLAG cells by FACS analysis. FACS histograms of U2OS parental (black) and U2OS-hTRPA1-FLAG (blue) cells were overlayed. The x- and y-axes show phycoerythrin (PE) intensity and cell counts, respectively. (C) Several hybridomas showed specific binding to hTRPA1. Geometric mean values of binding of various antibodies in hybridoma to U2OS or U2OS-hTRPA1-FLAG are shown. Generation of Mouse mAbs That Bind Cells Expressing TRPA1 Channels. Murine mAbs to hTRPA1 were generated by immunization of mice with recombinant adenoviral (rAd) vector and plasmid DNA carrying the hTRPA1 cDNA. Mice were immunized initially with rAd expressing hTRPA1 followed by electroporations with a plasmid DNA containing the hTRPA1 cDNA (Ross et al., 2012). Prior to immunization, expression of functional hTRPA1 protein from both the rAd vector and the plasmid DNA was confirmed by Western blot and 45Ca2+ uptake assays (data not shown). Hybridomas were generated using splenocytes from immunized mice that had appreciable serum antibody titer as determined by flow cytometry using U2OS cells stably expressing hTRPA1-FLAG (data not shown). Conditioned media containing murine mAbs from the hybridomas were screened for their binding to hTRPA1 using U2OS-hTRPA1-FLAG cells (Fig. 2C). The 16 hybridoma lines whose conditioned media showed >2-fold binding to U2OS-hTRPA1-FLAG cells compared with that of parental U2OS cells were scaled up for IgG purification. Anti-hTRPA1 IgGs were purified by Protein G affinity chromatography for further characterizations. Murine Anti-hTRPA1 mAbs Block Multiple Modes of TRPA1 Activation. To determine whether the purified IgGs block hTRPA1 channel activation, they were first screened for binding to a second cell line (CHO-hTRPA1 cells; Fig. 3A) prior to the evaluation of antagonism in an AITC-induced 45Ca2+ uptake assay at a single concentration of 0.67 µM. An irrelevant IgG and a small molecule TRPA1 antagonist (AMG9090 [N-(2,2,2-trichloro-1-((4-chlorophenyl)sulfanyl)ethyl)benzamide]) were used as negative and positive controls, respectively. The purified anti-hTRPA1 IgGs showed varying degrees of inhibition (from 10 to 60%) of AITC-induced activation of hTRPA1 (Fig. 3B). On the basis of these results, the two hybridoma lines that showed >50% inhibition (2B10 and 2D1) were subjected to subcloning for generation of unequivocal mAbs. Conditioned media from the subcloned hybridoma lines were first confirmed for hTRPA1 binding by FACS (data not shown). The monoclonals were then scaled up for IgG purification and further characterization in various assays. Evaluation of anti-hTRPA1 mAbs using CHO-hTRPA1 cells. (A) Representative FACS overlay of mAb binding to hTRPA1. CHO-hTRPA1 (red) and CHO parental (black) cells were incubated with conditioned media from hybridoma lines and goat anti-murine IgG-allophycocyanin. Before the FACS assay, 7-amino-actinomycin D was added to the stained cells. Histograms shown here are from live cell populations. The histogram of CHO-hTRPA1 (red) shows a modest shift from CHO parental cells (black). (B) Purified anti-hTRPA1 IgGs inhibit AITC activation of hTRPA1. Sixteen hTRPA1-specific IgGs and a negative control murine IgG were tested for antagonist activity at AITC-activated hTRPA1 in CHO-hTRPA1 cells at a single concentration of 0.67 µM. Inhibition of 45Ca2+ uptake by a positive control small molecule antagonist, AMG9090, was nearly complete as expected and was set as 100% with all other values normalized to this. A few purified hTRPA1-specific IgGs (2C8, 2B10, and 2D1) showed >50% inhibition. To characterize the anti-hTRPA1 mAbs as antagonists of TRPA1 by different modes of activation, we began testing their effects in the AITC-induced 45Ca2+ uptake assay. The EC90 concentration (80 μM) of AITC (based on previous concentration response studies; Klionsky et al., 2007) was used for activation of TRPA1 in these assays. The addition of the TRPA1 antagonist mAbs 2B10 and 2D1 to the cells inhibited 45Ca2+ uptake in a concentration-dependent manner (Fig. 4A; Table 1). Interestingly, maximal inhibition by both mAbs (2B10 and 2D1) was approximately 70%, whereas the small molecule positive control compound AMG9090 completely blocked AITC-induced 45Ca2+ uptake. The IC50 values for AITC-activated hTRPA1 inhibition mediated by AMG9090, 2B10, and 2D1 were 87 ± 28 nM, 260 ± 73 nM, and 480 ± 50 nM, respectively. By contrast, an irrelevant murine IgG did not block AITC-induced 45Ca2+ uptake (Fig. 4A). Purified murine anti-hTRPA1 IgGs inhibit TRPA1 activation by AITC (A) and cold (B) in a concentration-dependent manner. The purified mAbs 2B10 (▪) and 2D1 (▴) in parallel with a negative control antibody (murine IgG; ○) were tested in the agonist AITC-induced (A) and cold-induced (B) 45Ca2+ uptake assays. 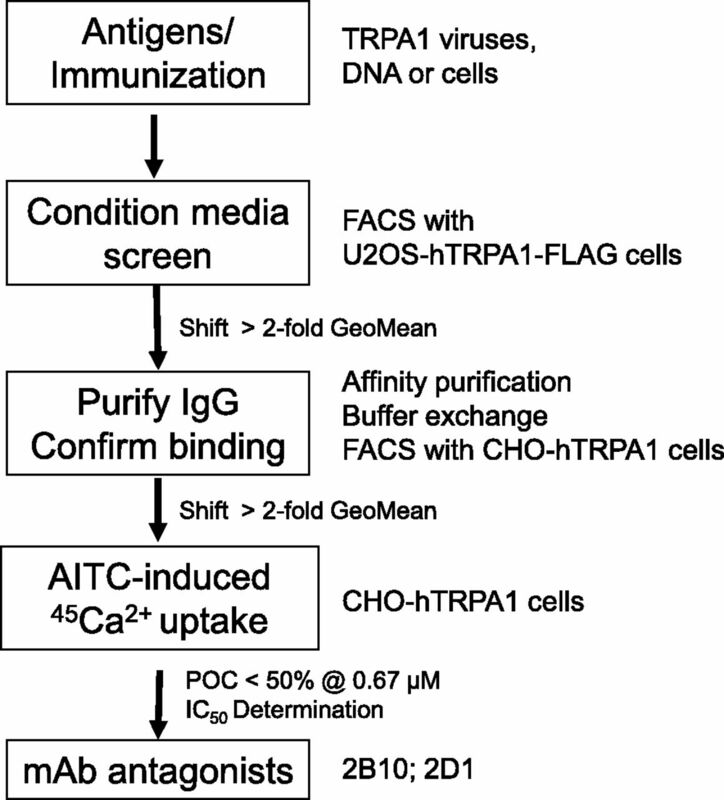 To determine the IC50 concentrations, increasing concentrations of AMG9090 and anti-hTRPA1 antibodies were incubated with CHO-hTRPA1 cells prior to the addition on AITC or cell plates were chilled at 4°C. The corresponding dose-response curves were used to calculate the corresponding IC50 concentration for each reagent (Table 1). AMG9090 (●) was used as a positive control. Uptake of 45Ca2+ caused by AITC (A) or cold temperature (B) alone was considered 100% and all of the other values are shown as the percent of control (POC). In addition to reactive chemical activators, cold temperature has been shown to activate TRPA1 in recombinant expression systems (Story et al., 2003; Corey et al., 2004; Story and Gereau, 2006; Klionsky et al., 2007). Furthermore, recent studies unequivocally showed that cold indeed activates TRPA1 in calcium imaging experiments as well as in single channel recordings (Sawada et al., 2007). Hence, we examined the ability of 2B10 and 2D1 mAbs to inhibit cold-induced 45Ca2+ uptake through hTRPA1 (Fig. 4B). Both 2B10 and 2D1 inhibited cold-induced 45Ca2+ uptake with IC50 values of 90 ± 30 nM and 210 ± 58 nM, respectively. 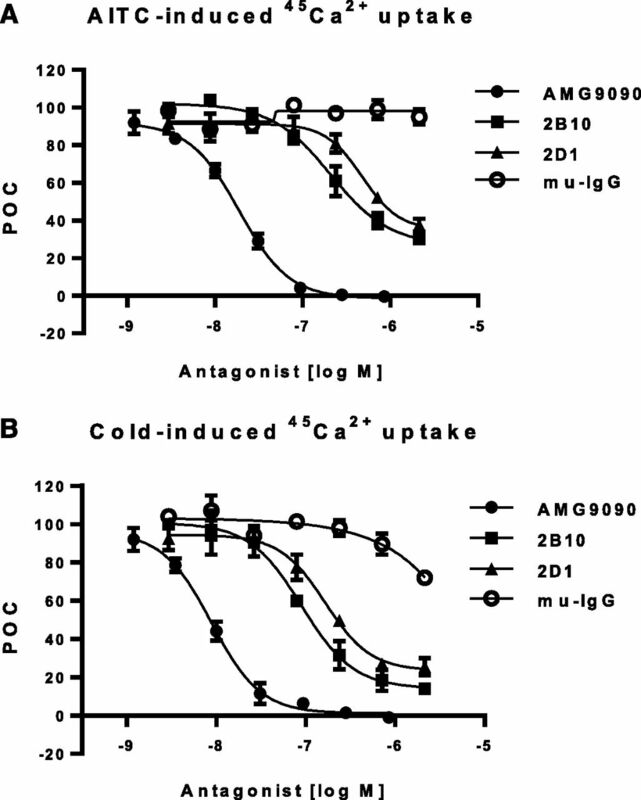 The positive control (AMG9090) inhibited the cold-induced 45Ca2+ uptake activity with an IC50 value of 12 ± 5 nM, whereas the negative control (irrelevant IgG) did not show significant inhibition. It is interesting to note that the antagonist mAbs are more potent at inhibiting cold activation of hTRPA1 compared with AITC activation. In addition to AITC and cold activation, osmotic changes also activate TRPA1 (Zhang et al., 2008). To evaluate the antagonist mAbs on osmotically activated TRPA1 channels, we first characterized the 45Ca2+ uptake in CHO-TRPA1 cells treated with different osmotic pressures. CHO–transient receptor potential vanilloid 4 (TRPV4) cells (Klionsky et al., 2007) served as positive controls in the experiment. In this assay, hypotonic osmotic pressures of 50 and 100 mOsmol/l activated both TRPV4 and TRPA1 channels as measured by an increase in 45Ca2+ uptake with no activity observed in the parental CHO cells (Fig. 5, A and B). We then evaluated 2B10 and 2D1 mAbs in the hypotonicity (50 mOsmol/l)-induced 45Ca2+ uptake assay utilizing the CHO-TRPA1 cells. Both 2B10 and 2D1 inhibited hypotonicity-induced 45Ca2+ uptake with IC50 values of 350 ± 60 nM and 570 ± 160 nM, respectively. The small molecule positive control (AMG9090) also inhibited hypotonicity-induced 45Ca2+ uptake with an IC50 value of 75 ± 48 nM, whereas the negative control (irrelevant IgG) did not show significant inhibition (Fig. 5C). Evaluation of osmotic pressure activation of TRPV4 and TRPA1 channels. (A) Hypotonicity activates TRPV4. (B) Hypotonicity activates TRPA1. (C) Both 2B10 and 2D1 inhibit hypotonicity activation of TRPA1. 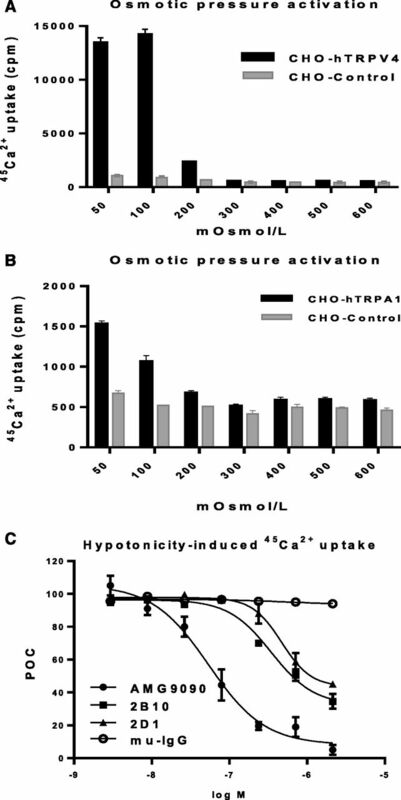 CHO-hTRPV4 (black bar in A) and CHO-hTRPA1 (black bar in B) cells were exposed to 50–500 mOsmol/l of osmotic pressure and then 45Ca2+ uptake was measured. (A) hTRPV4 was maximally activated in osmotic pressures corresponding to 50 and 100 mOsmol/l compared with CHO parental cells (CHO-control; gray bars). (B) hTRPA1 activation was highest at an osmotic pressure of 50 mOsmol/l. A 3-fold increase in 45Ca2+ uptake was observed in CHO-hTRPA1 cells compared with CHO parental cells (gray bars). (C) Both 2B10 (▪) and 2D1 (▴) in parallel with a negative antibody (murine IgG; ○) control were treated at an increasing concentrations. AMG9090 (●) and anti-hTRPA1 antagonist mAbs 2B10 and 2D1 concentration dependently inhibited hypotonicity (50 mOsmol/l)-induced 45Ca2+ uptake. Murine IgG did not inhibit hypotonicity-activated TRPA1. IC50 values from corresponding curves were calculated (Table 1). POC, percent of control. Trevisani et al. (2007) previously reported that excess accumulation of reactive oxygen species produced at inflammatory sites leads to the production of reactive chemicals, such as 4-ONE, a product of lipid peroxidation. Previous reports indicate that these products of lipid peroxidation activate TRPA1 and may contribute to inflammatory pain behavior in rodent models of inflammation (McMahon and Wood, 2006; McGaraughty et al., 2010; Lapointe and Altier, 2011). To evaluate the ability of the antagonist mAbs to block TRPA1 activation by reactive lipid peroxidation products, we first determined the EC90 values for 4-ONE, 4-HNE, and 4-hydroxyhexenal in their concentration-dependent curves of 45Ca2+ uptake into CHO-TRPA1 cells. 4-ONE acted as a potent agonist at TRPA1 in this assay with an EC90 value of 37 ± 16 µM (Fig. 6A). The EC90 values for 4-HNE and 4-hydroxyhexenal were 312 ± 10 µM and 574 ± 128 µM, respectively, whereas the historic EC90 value of the positive control AITC was approximately 80 µM. We then evaluated the ability of mAbs to inhibit 4-ONE–induced 45Ca2+ uptake at a single concentration of 0.67 µM. AMG9090 was used as a positive control at 0.1 µM. Both antagonist mAbs 2B10 and 2D1 inhibited 4-ONE–induced 45Ca2+ uptake (Fig. 6B) with a maximum inhibition of approximately 50% by 2B10 and 60% by 2D1. By contrast, AMG9090 showed near complete inhibition and the irrelevant mouse IgG had no effect. Evaluation of endogenous ligand activation of TRPA1. (A) Endogenous ligands 4-ONE, 4-HNE, and 4-hydroxyhexenal (4-HHE) activate TRPA1 in a concentration-dependent manner. The EC90 values for 4-ONE (●), 4-HHE (▪), and 4-HNE (▵) were determined by incubating CHO-hTRPA1 cells with varying concentration of the agonists and quantitating 45Ca2+ uptake into the cells. (B) Both 2B10 and 2D1 inhibit 4-ONE activation of TRPA1. A single concentration of antagonist mAbs (0.67 μM), a negative control antibody (murine IgG), and a positive control (AMG9090) were evaluated for inhibition of EC90 concentration of 4-ONE–induced 45Ca2+ uptake into the CHO-hTRPA1 cells. Since there is a high homology between the rat and human TRPA1 pore loop regions [93% consensus in pore loop 3 region (amino acids 895–940 and 898–943 for human and rat TRPA1, respectively); Fig. 7], we evaluated the ability of several different mAbs, including 2B10, 2D1, and other subclones, to block AITC activation of rat TRPA1. The extent of mAb inhibition of human TRPA1 strongly correlated with inhibition of rat TRPA1 (R2 = 0.96; Fig. 7B), suggesting that these antibodies may be binding at an extracellular pore loop 3 region with high homology. Furthermore, to assess selectivity, we also evaluated the ability of 2B10 and 2D1 to block human TRPM8 (Fig. 7C). The small molecule antagonist M8-B [N-(2-aminoethyl)-N-(4-(benzyloxy)-3-methoxybenzyl)thiophene-2-carboxamide hydrochloride] served as the positive control in this assay (Almeida et al., 2012). Neither 2B10 nor 2D1 showed any inhibition of icilin-induced 45Ca2+ uptake into CHO cells stably expressing human TRPM8, suggesting the absence of mAb binding epitopes on TRPM8. Amino acid sequence alignment of the pore loop region. (A) The putative pore loop regions from hTRPA1 (amino acids 895–940), ratTRPA1 (amino acids 898–943), and human transient receptor potential melastatin 8 (hTRPM8) (amino acids 901–947) were aligned using Vector NTI software (Life Technologies Inc., Carlsbad, CA). Colors in letters and foregrounds represent the following: red letters with a yellow foreground are identical, black letters with a green foreground are similar, blue letters with a cyan foreground are conservative, and green letters without a foreground are weakly similar. (B) Anti-hTRPA1 antagonist mAbs 2B10 and 2D1 inhibit AITC activation of rat TRPA1. Several mAb subclones, including 2B10 and 2D1, were tested for antagonism of an AITC-induced 45Ca2+ uptake assay into CHO cells stably expressing rat TRPA1. Correlations between inhibition of hTRPA1 and rat TRPA1 are plotted. A highly significant R2 value of 0.96 shows that these antibodies are capable of inhibiting both the hTRPA1 and rat TRPA1 (rTRPA1) channels. (C) Anti-hTRPA1 antagonist mAbs 2B10 and 2D1 do not inhibit icilin activation of hTRPM8. Anti-hTRPA1 antagonist mAbs 2B10 and 2D1 were evaluated in an icilin-induced 45Ca2+ uptake assay into CHO-hTRPM8 cells. A small molecule antagonist (M8-B) was used as a positive control (Almeida et al., 2012). A single concentration of antagonist 2B10 and 2D1 mAbs (0.67 μM) was evaluated for inhibition of EC90 concentration of icilin activation of hTRPM8. Anti-TRPA1 antagonist mAbs 2B10 and 2D1 and the negative control (murine IgG) had no significant effect on icilin activation hTRPM8, whereas the positive control (M8-B) fully blocked hTRPM8 activation. We generated mAbs that selectively bind TRPA1 by immunizing mice with adenoviral TRPA1 vectors. Characterization of the mAbs in an AITC-induced 45Ca2+ uptake assay led to identification of antagonist mAbs. Further characterization of antagonist antibodies 2B10 and 2D1 in an endogenous ligand (4-ONE), cold, and hypotonicity-induced 45Ca2+ uptake suggested that both 2B10 and 2D1 are capable of blocking TRPA1 activation by these diverse stimuli. Unfortunately, the potency of these antibodies to block TRPA1 is relatively weak from the therapeutic perspective. Since the mAbs are expected to bind outside of the plasma membrane in agonist-induced 45Ca2+ uptake assays, we propose that 2B10 and 2D1 are binding to the extracellular surface of TRPA1. It is most probable that loop 3 (which forms part of the pore) is the region where these mAbs bind because among the three putative extracellular loops in TRPA1, loop 2 is very small and not much is exposed on the extracellular side, and 2B10 and 2D1 bind to TRPA1 with loop 1 either intact or disrupted with a FLAG tag insertion (U2OS-hTRPA1-FLAG used in the FACS assay). This is further supported by the fact that the mAbs also blocked the highly homologous rat TRPA1 but not TRPM8, which has the least homology in the loop 3 region (Fig. 7). We and several others have shown that polyclonal (Zhou et al., 1998; Klionsky et al., 2006; Naylor et al., 2008) and monoclonal (Gómez-Varela et al., 2007; this study) antibodies to the third extracellular loop (loop 3) that forms the pore in different ion channels can act as antagonists (see reviews by Naylor and Beech, 2009; Sun and Li, 2013). Interestingly, most of the antibodies blocked their respective channel’s activation by multiple ligands, which bind to different locations in the channel (e.g., capsaicin at transmembrane regions 2–4 and protons that act through loop 3 in TRPV1; Klionsky et al., 2006), suggesting that high-affinity binding of antibodies to the pore loop holds the channel in a closed confirmation or blocks the pore. Although we do not know exactly where 2B10 and 2D1 bind to the TRPA1 channels, we propose that these mAbs perhaps act through high-affinity binding to the pore loop region, based on their ability to block diverse modes of activation. Compounds such as AITC and 4-ONE act through modifications of cysteines in the intracellular N terminus (Hinman et al., 2006; Macpherson et al., 2007), whereas cold and hypotonicity are thought to induce conformational changes to open the TRPA1 channels. The ability of 2B10 and 2D1 to inhibit these different activation mechanisms might arise from high-affinity binding of mAbs to extracellular surfaces of TRPA1, such as the pore loop. All of the ion channel antagonist antibodies reported to date only partially block channel activation. It is interesting to note that mAbs 2B10 and 2D1 also showed only 70% maximum inhibition of AITC-induced TRPA1 activation. Unlike AMG9090, the mAbs were not able to completely abolish AITC-induced TRPA1 activation, suggesting that 2B10 and 2D1 may only partially stabilize the channel conformation in the closed state, although we cannot completely exclude the possibility that the mAbs act as partial pore blockers of TRPA1. It was reported that one mAb that binds close to the pore in the loop 3 region of a human ether à go-go (hERG) potassium channel also inhibited hERG currents by only 40% (Gómez-Varela et al., 2007). Partial inhibition of the respective channels by both polyclonal antibodies and mAbs reveals a challenge for therapeutic antagonism of this channel family with an antagonist antibody. Three critical success factors for generation of mAbs that could act as antagonists are as follows: 1) the size, sequence, and immunogenicity of the pore forming loop; 2) having effective screening cell lines and a positive control for the binding assay (the FLAG tag that we inserted into loop 1 of TRPA1 was a critical control in the FACS assay); and 3) the proximity of the antigenic region to the pore (it appears that an antibody binding site close to the pore is better for antagonism based on the fact that one antibody that binds close to the hERG pore blocked channel activation, whereas another that binds further away from the pore did not; Gómez-Varela et al., 2007). Development of antagonist mAbs to ion channels with large extracellular loops, such as P2X7, seems readily feasible (Buell et al., 1998). However, based on the following evidence, generation of antagonist mAbs that are suitable for therapeutic use appears to be very difficult for ion channels such as the TRP channels that have small extracellular regions. First, several polyclonal antibodies to ion channel pore loops are reported to act as antagonists (Zhou et al., 1998; Klionsky et al., 2006; Naylor et al., 2008; Sun and Li, 2013), whereas only two mAb antagonists have been reported to date (Gómez-Varela et al., 2007; this study). Second, mAbs that bind to the pore loop regions of TRPV1 did not block channel activation (Klionsky et al., 2006). Finally, all antagonists reported to date (whether polyclonal or monoclonal) showed only partial inhibition and it is unknown whether a therapeutic effect can be achieved with only partial antagonism of ion channels. The fact that antagonist mAbs have been generated to hERG and hTRPA1 indicates some potential for the feasibility of mAbs as therapeutics for ion channels. The authors thank Ken Wild and Jacinthe Gingras for critical reading of the manuscript, and Yu Sun for help with generation of the U2OS-hTRPA1-FLAG cell line. Participated in research design: Lee, Plewa, Gavva. Conducted experiments: Wang, Padaki, Bi, Plewa. Wrote or contributed to the writing of the manuscript: Lee, Wang, Padaki, Bi, Plewa, Gavva. (2012) Pharmacological blockade of the cold receptor TRPM8 attenuates autonomic and behavioral cold defenses and decreases deep body temperature. J Neurosci 32:2086–2099. Arvedson T, Dyas G, Rottman J, and Sasu B (2009) inventors, Amgen Inc., assignee. Ferroportin antibodies and methods of use. International patent WO 2009094551 A1. 2009 Jul 30. (2001) Lentivirus vectors encoding both central polypurine tract and posttranscriptional regulatory element provide enhanced transduction and transgene expression. Hum Gene Ther 12:1103–1108. (2005) Pungent products from garlic activate the sensory ion channel TRPA1. Proc Natl Acad Sci USA 102:12248–12252. (1998) Blockade of human P2X7 receptor function with a monoclonal antibody. Blood 92:3521–3528. (2011) Selective blockade of TRPA1 channel attenuates pathological pain without altering noxious cold sensation or body temperature regulation. Pain 152:1165–1172. (2012) Transient receptor potential melastatin 8 (TRPM8) channels are involved in body temperature regulation. Mol Pain 8:36. (2010) Cough: The Emerging Role of the TRPA1 Channel. Lung 188 (Suppl 1):S63–S68. (2008) TRPA1: irritant detector of the airways. J Physiol 586:3303. (2007) Monoclonal antibody blockade of the human Eag1 potassium channel function exerts antitumor activity. Cancer Res 67:7343–7349. (2006) TRP channel activation by reversible covalent modification. Proc Natl Acad Sci USA 103:19564–19568. (1968) The role of sensory nerve endings in neurogenic inflammation induced in human skin and in the eye and paw of the rat. Br Pharmacol Chemother 33:32–41. (2007) Species-specific pharmacology of trichloro(sulfanyl)ethyl benzamides as transient receptor potential ankyrin 1 (TRPA1) antagonists. Mol Pain 3:39. (2006) A polyclonal antibody to the prepore loop of transient receptor potential vanilloid type 1 blocks channel activation. J Pharmacol Exp Ther 319:192–198. (1993) The ability of humans to localise noxious stimuli. Neurosci Lett 150:219–222. (2010) A gain-of-function mutation in TRPA1 causes familial episodic pain syndrome. Neuron 66:671–680. (2011) The role of TRPA1 in visceral inflammation and pain. Channels (Austin) 5:525–529. (2007) Expression of anti-apoptotic factors modulates Apo2L/TRAIL resistance in colon carcinoma cells. Apoptosis 12:1465–1478. (2007) Noxious compounds activate TRPA1 ion channels through covalent modification of cysteines. Nature 445:541–545. (2005) The pungency of garlic: activation of TRPA1 and TRPV1 in response to allicin. Curr Biol 15:929–934. (2010) TRPA1 modulation of spontaneous and mechanically evoked firing of spinal neurons in uninjured, osteoarthritic, and inflamed rats. Mol Pain 6:14. (2007) TRPA1 mediates formalin-induced pain. Proc Natl Acad Sci USA 104:13525–13530. (2014) TRPA1 channels mediate acute neurogenic inflammation and pain produced by bacterial endotoxins. Nat Commun 5:3125. (2009) Extracellular ion channel inhibitor antibodies. Open Drug Discovery J 1:36–42. (2008) Production of a specific extracellular inhibitor of TRPM3 channels. Br J Pharmacol 155:567–573. (2013) FACS-based isolation, propagation and characterization of mouse embryonic cardiomyocytes based on VCAM-1 surface marker expression. PLoS ONE 8:e82403. (1986) Does neurogenic inflammation alter the sensitivity of unmyelinated nociceptors in the rat? Brain Res 384:42–50. (2012) Molecular mechanism of hepcidin-mediated ferroportin internalization requires ferroportin lysines, not tyrosines or JAK-STAT. Cell Metab 15:905–917. (2007) Cold sensitivity of recombinant TRPA1 channels. Brain Res 1160:39–46. (2006) Numbing the senses: role of TRPA1 in mechanical and cold sensation. Neuron 50:177–180. (2011) Transient receptor potential A1 modulators. Curr Top Med Chem 11:2227–2236. (2013) Antibody therapeutics targeting ion channels: are we there yet? Acta Pharmacol Sin 34:199–204. (2009) TRPA1: a potential target for anti-tussive therapy. Pulm Pharmacol Ther 22:71–74. (2007) 4-Hydroxynonenal, an endogenous aldehyde, causes pain and neurogenic inflammation through activation of the irritant receptor TRPA1. Proc Natl Acad Sci USA 104:13519–13524. (2009) TRPA1 modulators in preclinical development. Expert Opin Ther Pat 19:1787–1799. (2011) TRPA1 is required for histamine-independent, Mas-related G protein-coupled receptor-mediated itch. Nat Neurosci 14:595–602. (2013) The ion channel TRPA1 is required for chronic itch. J Neurosci 33:9283–9294. (2005) Generation of functional ion-channel tools by E3 targeting. Nat Biotechnol 23:1289–1293. (2008) Transient receptor potential A1 mediates an osmotically activated ion channel. Eur J Neurosci 27:605–611. (1998) Temperature-sensitive neuromuscular transmission in Kv1.1 null mice: role of potassium channels under the myelin sheath in young nerves. J Neurosci 18:7200–7215.